This lithograph features art from the band’s new album, ‘Trauma‘. These limited-edition signed lithographs are only available in the album bundles. The title of the band’s new album, ‘Trauma‘, is embroidered on the front of this high-quality snapback hat. 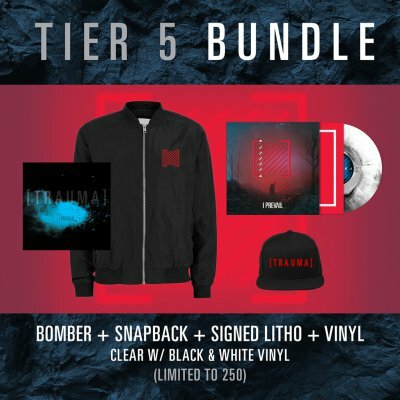 The Album Bracket Logo is printed on the front chest with the Trauma Bracket logo printed across the upper back of this high-quality black bomber jacket. This purchase includes a digital download of the singles “Bow Down” and “Breaking Down” as well as the entire album. You will be emailed a link to access “Bow Down” and “Breaking Down” shortly after purchase. You will be emailed a link to access the full album download on the release date.